The tests will give a definite genotype. The P2 (MYOT) test will give a genotype of n/n, n/P2, or P2/P2. Most n/P2 horses will develop late-onset PSSM2; some n/P2 horses will not develop PSSM2 even through the second decade of life. P2/P2 horses will develop early-onset PSSM2. 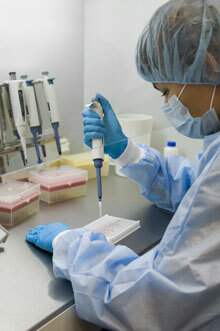 The P3 (FLNC) test will give a genotype of n/n, n/P3, or P3/P3. Horses that are n/P3 will develop late-onset MFM, a subtype of PSSM2. P3/P3 horses will develop early-onset PSSM2/MFM. The P4 (MYOZ3) test will give a genotype of n/n, n/P4, or P4/P4. Horses that are n/P4 will develop late-onset MFM, a subtype of PSSM2. P4/P4 horses will develop early-onset PSSM2/MFM. It is possible for a horse to have any combination of P2, P3, and P4 variants. Because there are three genotypes for each variant, there are 27 possible genotypes. There are other genetic variants that predispose to PSSM2, MFM, and related adult-onset myopathies. We do not yet have tests for these variants. These are newly-developed experimental tests. Our results have not yet been published in a peer-reviewed scientific journal. Submit a hair sample. Only one sample per horse is needed to conduct all tests. Customers in the European Union (EU) should purchase tests from the Center for Animal Genetics (CAG GmbH). The European Union includes Austria, Belgium, Bulgaria, Croatia, Cyprus, Czech Republic, Denmark, Estonia, Finland, France, Germany, Greece, Hungary, Ireland, Italy, Latvia, Lithuania, Luxembourg, Malta, Netherlands, Poland, Portugal, Romania, Slovakia, Slovenia, Spain, Sweden, and the United Kingdom. Please note that the United Kingdom shall be considered part of the EU even after Brexit. Customers outside of the United States and the EU may submit a sample as dried blood on a card. Once you place an order, you will be sent a sample collection card and instructions. Only one sample per horse is needed to conduct all tests.